This is to draw your urgent attention towards the news report 'Chinese car maker Chery announces Brazil recall of 12,500 vehicles for asbestos' (Washington Post, August 30, 2012) revealing recall of cars sold after asbestos was found in engine and exhaust gaskets by Chery International, a Chinese automaker. The news report is attached. This follows ban on entry of China-made cars containing incurable cancer causing asbestos in its structure in Australia. Australia is one of the 53 countries that have banned the import of asbestos. India is yet to ban it. Almost all the vehicles in India are laden with asbestos based components. There is no building in India which is asbestos free. I submit that taking cognizance of threats to life and public health; more than 50 countries have banned production, use, manufacture and trade of the hazardous mineral fiber, ASBESTOS. These countries are: Algeria, Czech Republic, Iceland, Malta, Seychelles, Argentina, Denmark, Ireland, Mozambique, Slovakia, Australia, Egypt, Israel, Netherlands, Slovenia, Austria, Estonia, Italy, New Caledonia, South Africa, Bahrain, Finland, Japan, Norway, Spain, Belgium, France, Jordan, Oman, Sweden, Brunei, Gabon, South Korea, Poland, Switzerland, Bulgaria, Germany, Kuwait, Portugal, Turkey, Chile, Greece, Latvia, Qatar, United Kingdom, Croatia, Honduras, Lithuania, Romania, Uruguay, Cyprus, Hungary, Luxembourg and Saudi Arabia. All the 27 countries of European Union have banned it. I wish to inform you that on August 15 August, 2012 news came from Australia that an Australian importer has recalled 23,000 cars made by China's Great Wall Motor Co Ltd and Chery Automobile Co after deadly asbestos fibres were found in engines and exhaust gaskets. The importer, Ateco Automotive has been asked by Australian Competition and Consumer Commission to replace affected components in the cars. Dealers have also been asked to stop selling the asbestos laden cars. The news report ‘23,000 China-made cars recalled in Oz for asbestos parts’ is attached. I submit that this news is quite relevant to our country because disregarding disastrous public health consequences, trade, manufacture and consumption of asbestos based products is rising at an alarming rate due to fiscal incentives of the central government since 1982. I submit that the World Health Assembly Resolution on cancer prevention has urged the countries to pay special attention to cancers for which avoidable exposure is a factor, including exposure to chemicals at the workplace. The World Health Assembly has requested WHO to carry out a global campaign for the elimination of asbestos-related diseases. WHO Resolution is aimed at eliminating asbestos-related diseases is particularly targeted at countries still using chrysotile asbestos, in addition to assistance in relation to exposures arising from historical use of all forms of asbestos. I submit that besides mining of asbestos of all kinds, trade in asbestos waste (dust & fibers) is banned in India. In June 1993, central government stopped the renewal of existing mining leases of asbestos. The mining activity was banned by Union Ministry of Mines. It is strange that while mining of asbestos is banned in our country due to adverse health impact, the same is being imported from Russia, Canada and other countries. It may be noted that Canada has a no home use policy and it is investing to decontaminate its built environment of asbestos. I submit that UN headquarters has been decontaminated of asbestos besides Canadian House of Commons. It is about time Indian buildings like its legislatures, courts, schools, hospitals etc also became asbestos free. I submit that the term asbestos refers to a group of naturally occurring fibrous minerals. The principal forms of asbestos are chrysotile (white asbestos) and crocidolite (blue asbestos). Other forms are amosite, anthophylite, tremolite and actinolite. It is noteworthy that chrysotile asbestos represents 100% of the global asbestos trade. I submit that according to a Fact sheet No.343 of World Health Organisation (WHO) titled ‘Asbestos: elimination of asbestos-related diseases’ dated July 2010, “All forms of asbestos are carcinogenic to humans, and may cause mesothelioma and cancer of the lung, larynx and ovary. Asbestos exposure is also responsible for other diseases, such as asbestosis (fibrosis of the lungs), pleural plaques, thickening and effusions.” The harmful effects of asbestos of all kinds have been established conclusively. I submit that the Indian Mines Ministry has consistently informed the Parliament that “In view of the hazardous effect of asbestos mining on health, the Government has decided not to grant any new lease for mining of asbestos and minerals found along with asbestos. It does not renew the existing mining leases of asbestos. In view of the deleterious effect of asbestos mining on the health of the workers, the government has ordered the State governments in 1986 not to grant any new mining lease for asbestos (including chrysotile variety) in the country. I submit that unmindful of this asbestos has become so widespread in the country that on December 9, 2009 even President’s helicopter hit an abandoned asbestos roof. I submit that it high time India stopped procuring raw asbestos fibers from Russia’s Ural Asbestos Mining & Ore Dressing Company, the world's largest manufacturer. It should rescind its asbestos trade related agreements with Canada, Kazakhstan and Brazil. I submit that public health experts and environmental and occupational health specialists have argued for long that asbestos should be buried not people. The continued use of asbestos in India is bound to lead to a public health disaster of asbestos-related illness and premature death for decades to come. This will be repeating the epidemic that is witnessed today in developed countries that used asbestos in the past. I submit that both International Labour Organization (ILO) and WHO recognize that the most efficient way to eliminate asbestos-related diseases is to stop the use of all types of asbestos, replace asbestos with safer substitutes, take measures to prevent exposure to asbestos in place and during asbestos removal and improve early diagnosis, treatment, social and medical rehabilitation of asbestos-related diseases and to establish registries of people with past and/or current exposures to asbestos. ILO also passed a resolution seeking elimination of future usage of asbestos of all forms in June 2006. How can such glaring scientific and medical facts be ignored? I submit that National Human Rights Commission (NHRC) has issued notices to all the State Governments, Union Territories and concerned ministries of central government to file the status of asbestos disease victims and asked them why it should not be banned. The Commission has underlined that keeping inmates under asbestos roof is harmful and alternative roofs should be used. But so far only the States of Mizoram, Nagaland and the National Institute of Occupational Health Ahmedabad have submitted the reports. NHRC’s intervention has been sought for a ban on the use of chrysotile asbestos (white asbestos), which is hazardous for the health of people and causes various incurable diseases. While Government has rightly banned mining of asbestos, yet it allowed its import and that too from the countries like Canada which did not prefer its domestic use. I submit that unmindful of such developments in the world and within the country, it appears that Ministry of Commerce is unable to resist asbestos industry’s influence in public interest and desist from signing the "Comprehensive Economic Partnership Agreement" (CEPA) with Canada that allows the export of cancer causing Canadian asbestos to India. The New Democratic Party (NDP) of Canada, the official Opposition party has revealed the efforts of Canadian Prime Minister, Stephen Harper government to eliminate trade tariffs on exports of lethal Canadian asbestos to India. “It is a disgrace that the Harper government has opposed the global effort to ban this substance,” NDP said in a release dated December 5, 2011. I submit that Quebec provincial government’s $58 million subsidy to re-open the Jeffrey asbestos mine reveals that asbestos traders remain callous towards the public health crises that has emerged due to asbestos exposure. Jeffrey mine plans to export 200,000 tonnes of asbestos annually to Asian countries including India for the next 25 to 50 years. I submit that Québec's Medical and Health authorities are also opposed to this asbestos mining project. Their call on the Québec government to stop the mining and export of asbestos has been ignored. I submit that besides WHO and ILO the International Trade Union Confederation that represents 176 million workers in 151 countries have called for an end to the use of all forms of asbestos, including chrysotile asbestos. I submit that asbestos is claiming more than 100,000-150,000 cancer deaths a year worldwide. I submit that while Canadian government is spending millions of dollars to remove chrysotile and other forms of asbestos from public buildings. This removal is underway even in Quebec’s schools, hospitals and buildings in order to protect the lives of the Quebec people. I submit that Central Governments and State Governments should resist the tremendous influence of Chrysotile asbestos cement products manufacturers association in India, global asbestos industry in general and Canadian asbestos industry in particular. Cabinet Committee on Economic Affairs besides Planning Commission and State Governments need to coordinate efforts to eliminate asbestos and asbestos based products from the country. I submit that the International Commission on Occupational Health (ICOH) has called for a global ban on the mining, sale and use of all forms of asbestos and the elimination of asbestos-related diseases. I submit that there is international consensus has recommended that a total ban on production and use of all forms of asbestos is the best way to eliminate the occurrence of asbestos-related diseases. I submit that Delhi Government has banned use of asbestos roofs for new schools but sadly the same has not been extended to other buildings and products. In the meanwhile villagers’ protest in Muzaffarpur and Vaishali in Bihar has led to closure of asbestos factories. The construction of lung cancer causing white asbestos plants in Madhubani, West Champaran and production in Bhojpur districts is also facing resistance. I submit that villagers are protesting against the proposed hazardous asbestos cement roofing factories in Sambalpur and Bargarh district of Odisha. 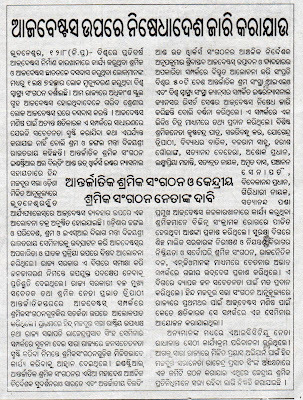 As a result the Sambalpur plant has been stopped. Protests against asbestos factories in states like Himachal Pradesh and Andhra Pradesh is also going on. I wish to draw your attention towards the recommendations of Kerala State Human Rights Commission. It made three recommendations banning use of asbestos roofs in its order dated January 31, 2009. The recommendations are: “a) The State Government will replace asbestos roofs of all school buildings under its control with country tiles in a phased manner. b) The Government will take steps to see that the schools run under the private management also replace the asbestos roofs with country tiles by fixing a time frame. c) The Government should see that in future no new school is allowed to commence its functions with asbestos roofs.” All State Human Rights Commissions ought to initiate steps to make their states asbestos free by adopting it. In such a scenario, it is quite disturbing that asbestos cement based building materials are being used in the Union Rural Development Ministry’s Indira Awas Yojna. Central government’s Rs 10, 000 crore worth annual housing flagship scheme endangers the rural poor as it is using carcinogenic asbestos sheets to keep the cost below the ceiling of Rs 45,000 per house under the scheme. Government should put a stay on use of such hazardous building materials and adopt alternative materials for both rural and urban housing schemes like Rajiv Awas Yojna. A NHRC member has objected to such cruel disregard for the lives of the unsuspecting poor who is bound to get exposed to killer fibers of asbestos. I submit that incessant campaign seeking asbestos free India has persuaded several ministries of Government of India and other agencies to discourage and phase out white asbestos trade. But the fact remains India remains one of the key consumers of asbestos from Quebec, Russia and other countries. Years of efforts by citizen groups are beginning to yield results. I submit that Union Ministry of Labour revealed that that the “Government of India is considering the ban on use of chrysotile asbestos in India to protect the workers and the general population against primary and secondary exposure to Chrysotile form of Asbestos" in concept paper by Union Ministry of Labour at the two-day 5th India-EU Joint Seminar on “Occupational Safety and Health” during 19-20 September, 2011. The Union Ministry of Chemicals took the right step on June 21, 2011 when it disassociated India from Canada and other asbestos producing countries in order to get white asbestos listed in the UN list of hazardous materials. Union Ministry of Railways is working to make all railway platforms in India asbestos free. The Vision Statement on Environmental Health of Union Ministry of Environment & Forests’ reads: “Alternatives to asbestos may be used to the extent possible and use of asbestos may be phased out”. The Union Ministry of Finance has announced that asbestos related diseases will be covered under Rashtriya Swasthya Bima Yojana but this is hardly sufficient in the absence of environmental and occupational infrastructure. It is high time government withdrew fiscal incentives from the asbestos industry to discourage use of asbestos products instead of promoting it. I submit that disregarding the epidemic of asbestos related diseases due to past exposure, new factories are coming up all over the country. White asbestos based business enterprises appear to have misled political parties that are ruling in the central and state governments into ignoring ban on it by almost all the developed countries. I submit that Dow Chemicals Company has set aside $2.2 billion in compensation fund to address future asbestos-related liabilities arising out of acquisition of Union Carbide Corporation and its Indian investments in 1999. Many manufacturers of asbestos-containing products have gone bankrupt in USA as a result of asbestos litigation. Government should also set up a compensation fund to provide compensation to the asbestos victims of past exposure by making asbestos based companies liable for knowingly exposing workers, consumers and citizens to asbestos fibers. In short, there is an urgent need to boycott asbestos products, phase out asbestos and asbestos based products, decontaminate asbestos laden building and products, to prepare a register of asbestos workers and victims of asbestos related diseases, to build environmental and occupational health infrastructure, to identify asbestos laden buildings, to prepare an inventory asbestos laden products, to set up a compensation fund for occupational and non-occupational victims of asbestos exposure. I also urge you ensure that the governments urgently initiates efforts aimed at primary, secondary and tertiary prevention of asbestos-related diseases through country-specific “National Programmes for Elimination of Asbestos-Related Diseases” in line with ILO and WHO guidelines. I also wish to take the opportunity to seek an appointment for a delegation to meet you to share relevant documents and insights in this regard. Harper says oilsands pipeline decision will be based on science – but what about asbestos? NO decent Quebecer should vote for the Liberal Party in the September 4 provincial election because Premier Jean Charest has disgraced himself by providing a loan of $58 million to reopen the province’s asbestos mine. Mineral Fibre Inc. which owns the Jeffrey Mine) is ready to do his demonic part to KILL more Indians. And then we South Asians have the nerve to accuse white guys of racism for every little thing! But thank God there are decent WHITE politicians out there who want to end this MASS MURDER of poor Indians. Charest’s Liberal Party is facing a tough fight as the latest polls indicate. On Wednesday, the Globe and Mail reported that the ThreeHundredEight.com’s vote and seat projection model shows that the Parti Quebecois (PQ) still held the lead with a projected 34.5 per cent support (58 seats likely), while the Liberals had 32.7 per cent support (47 seats likely). The Coalition Avenir Quebec (CAQ) would likely get 18 seats with their 22.7-per-cent support. PQ Leader Pauline Marois said her party was “very shocked” that Charest announced the loan without a debate and added that the PQ would hold a “societal debate” in Quebec’s legislature about what to do with the asbestos industry. Hopefully, the PQ members, if their party wins, will have the good moral sense and decency to ban this deadly product. CAQ Leader Francois Legault has shown more decisiveness and character than Marois on this issue. He told reporters that there was no need for a debate and that if his party were elected, they would phase out asbestos exports altogether. THIS brings me to the HYPOCRISY of Prime Minister Stephen Harper who is all for exporting asbestos to India where it is causing innumerable deaths and immense suffering to poor Indians. All the world’s most respectable and leading health experts, publications and organizations, including the WHO, have openly condemned Canada for exporting asbestos. For example, Ivan Ivanov, the team leader of occupational health at the WHO Department of Public Health and Environment, says “there is no safe threshold of exposure to all forms of asbestos” and that WHO wants a stop to the use of all types of asbestos as the most efficient way to get rid of all asbestos-related diseases. Yet this same Harper has the cheek to declare that the oilsands pipeline decision will be based purely on science! So shouldn’t we send IMMORAL POLITICIANS who kill people with asbestos to jail? I think the United Nations should intervene! AND on Wednesday, what I had been warning readers about came true! Sure enough, Enbridge Inc. acted as the ALMIGHTY GOD by making 1,000 square kilometres of islands disappear from Douglas Channel in its animated depiction of the proposed Northern Gateway pipeline and tanker route, amking it appear to be a safe, open waterway! And a very bad one, indeed! The company said that another video showing the channel in detail along with technical reports of the marine route were on their website. But does everyone have the time to do their own research on the website? Less than two months after the Quebec government gave Jeffrey mine a $58 million loan, the mine has encountered a severe financial crisis and has laid off about 80 if its one hundred workers. June 29, 2012, François Vaudreuil (president, CSD trade union confederation), Hugues Grimard (mayor of Asbestos), Yvon Vallières (member of the Québec National Assembly) and Bernard Coulombe (president of Jeffrey Mine Inc) celebrate the $58 million loan given by the Québec government to open the Jeffrey asbestos mine. The mine now belongs to Mineral Fibre (MF) Inc., a company owned by Baljit Chadha and Bernard Coulombe. Chadha, a Montreal businessman, has exported asbestos from the Jeffrey mine to developing countries for the past sixteen years. He is a personal friend and a fund-raiser for Quebec premier Jean Charest. Coulombe was president of Jeffrey Mine Inc, the company that was the previous owner of the mine. Coulombe stated that the costs they are paying for carrying out the work to complete the underground mine were taking “a dangerous escalation”. He said that the work stoppage was a strategic decision aimed at giving time to negotiate agreements for lower prices with the mining contractor firm, C Thysen MAC, and the main suppliers for the acquisition of materials. The workers have been laid off work apparently until mid-November. Employees and residents of Asbestos are greatly concerned by the lay-off. This is just one more example of the irresponsibility of the Quebec Charest government in giving a $58 million loan to finance a deadly, dying industry that has no future. The people of Asbestos deserve better. Charest is playing with their lives and their hopes for sordid political reasons to win the riding in the present election. This is not political leadership. It harms the community and it brings shame on Quebec. The $58 million should be given to build sustainable and healthy economic development that will truly help the region. After week long blockade in front of the gates of the Vishaka Asbestos Plant at Parmanpur in Sambalpur Dist of Odisha, the plant has come to a grinding halt. There were 9 trucks inside carrying outward material and about 12 trucks waiting raw materials including Asbestos Fibres, cement and other raw material, which remained lined up in the heavy rains since past one week. The road blockade, by the farmers of the region, supported by the farmers whose land has been forcefully occupied by the company went out of stock of raw material and has come to grinding halt from today. The production today of the factory has been shutdown after this. The relentless fight of the people is now bearing fruit, with the administration bowing down to the legitimate pressure induced by people of the region. Also there has been a good meeting organized in the mean time by the Labour Unions, and the labour and forest ministrer Bijayashree Routray spoke in the meeting held in Bhubaneswar. 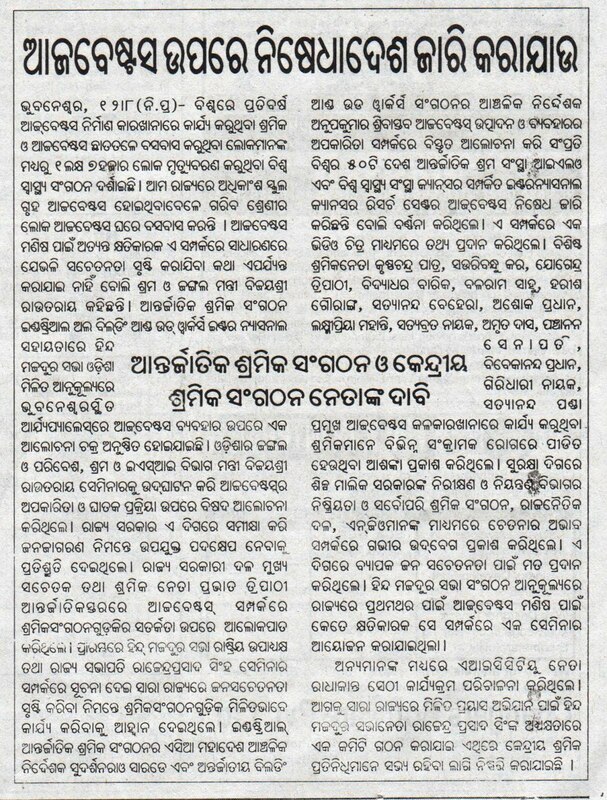 The labour unions and international organisations have demanded there to impose Ban on Asbestos - the news was published in Samaja news paper of 12th August. Asbestos fighters network of Odisha. Charest’s decision to grant $58 million loan to revive the Jeffery Mine. India over the next quarter of a century. Cancer and Research Institute and Tata Memorial Trust combined. investors led by Baljit Singh Chadha. unfortunately there has been no further progress on the matter. 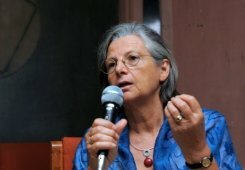 AFP - A top researcher and campaigner on industrial health issues has refused France's highest honour in protest at official inaction over what she described as "industrial crimes" in this sector. Annie Thebaud-Mony, director of research at France's National Institute for Health and Medical Research, turned down the "Legion d'Honneur" in a letter to Housing Minister Cecile Duflot made public on Saturday. Thebaud-Mony has written award-winning books on industrial health and is the spokeswoman for Ban Asbestos France. In her letter, she said she wanted to "challenge the impunity that until now has protected those who carry out industrial crimes". Thebaud-Mony said she was particularly concerned that the current economic crisis was eclipsing issues concerning workers' health and the environment. "My act is intended as a call for citizens, but also for parliament to act, for the respect of basic rights to life, health and dignity," she said in her letter to the ministry, dated July 31. "We want to be taken seriously when we expose the deterioration of working conditions ... the drama of workplace accidents and occupational diseases...," she added. She denounced what she said was a misguided debate over the issue of safe levels of certain toxic substances. Public officials have to take a stand against the threat that these substances pose, if necessary taking legal action against the offenders, she argued. Thebaud-Mony said that her own career had suffered for years because of her work. She called on the government to secure the jobs of young researchers working in the field of industrial health, in particular those investigating cancer-causing materials in the workplace. YES, MR. BALJIT CHADHA, YOU ARE EXPORTING DEATH TO INDIA – AND SHAME ON YOU! Do you REALLY believe that in spite of all the evidence out there ... ? Mr. Chadha, I guess money can perform miracles! Chadha, in fact, was rebuked by Ivan Ivanov, the team leader of occupational health at the WHO [World Health Organization] Department of Public Health and Environment, this week for DISTORTING its position on the safety of asbestos. He said WHO wants a stop to the use of all types of asbestos as the most efficient way to get rid of all asbestos-related diseases. Chadha needs to give his thick skull a REAL BIG SHAKE. THIS week, the Montreal Gazette reported that the provincial land registry indicates that Chadha took out a new $1.7-million mortgage on his Westmount home last April. The newspaper noted that last year in April, the provincial Liberal government had told Chadha and Jeffrey Mine President Bernard Coulombe – who are now co-owners of a new company called Mineral Fibre Inc. which owns the Jeffrey Mine - that it would provide them a guarantee on a $58-million loan if they could get $25 million in private investments to reopen the asbestos mine. The Montreal Gazette reported that the two businessmen have been able to find only a Thai company to invest, but the irony is that the government of Thailand is seriously considering a ban on asbestos. That company - Ulan Marketing Co. Ltd. – has come up with $14 million and the two businessmen have put together the remaining $11 million in private investment. Quebec Premier, Jean Charest, who is desperate to win in the upcoming provincial election, last month suddenly announce that his government would now give a $58-million loan to reopen the asbestos mine – and once again start KILLING POOR INDIANS IN INDIA with cancer and other asbestos-related diseases! AND in India, the highly respected Hindu newspaper reports that Toxics Watch Alliance (TWA), an Indian advocacy initiative and one of two members of the Ban Asbestos Network of India (BANI) movement, has stepped up its lobbying with the Indian federal government to stop asbestos usage by banning imports. TWA’s convener Gopal Krishna said: “Artificial pricing through governmental patronage has made asbestos cheaply available. Krishna noted: “There are multiple alternatives to the multiple uses of asbestos.” He pointed out that industries and countries that have banned asbestos have managed to do without it because of the availability of substitutes. Commonly cited alternatives to asbestos are cellulose and agricultural fibres. Re: “Jeffrey Mine backers face headwinds” (Gazette, July 31). In light of the recommendations of the Joint Policy Committee of the Societies of Epidemiology, which called for a global ban on the mining, use and export of all forms of asbestos, the $56-million loan offered by the Charest government must be immediately withdrawn. There is no longer any doubt that asbestos invariably causes disease and premature death, and that continued use of this deadly chemical can lead to a public health catastrophe. Quebec cannot afford to play the role of the devil in this asbestos deal.